You can also call it Half Full/Half Empty, depending the way you look at it. But, being a postive person, I will look it as a WINNER with little competition. Yes, I am talking about the New Fund Offer from the L&T stable, the L&T EMERGING BUSINESS FUND. 2 AMCs have come out to take advantage of the expected Big Bull Run going forward. Both the funds will be investing in Mid and small cap companies and are close ended and hence require stringent analysis before you commit your hard money into any of them. Strangely both the NFOs are Close Ended Fund. If you do want to go for a Close Ended Fund, then my vote would be L&T EMERGING BUSINESS FUND. The problem an Open End Small Cap Fund Manager faces is two faced. 1. If the fund does well, huge money comes in and the Fund Manager will be forced to deploy the money whatever the levels and valuations are. 2. If the does not do well, then money goes out and the Fund Manager is forced to exit his stocks at low levels. To overcome these handicaps, L&T AMC has made their New Fund SBI Emerging Business Fund a Close Ended Fund. The biggest problem faced by small Caps is that these stocks are the 1st to bear the brunt in case of a massive sell off. When I asked about this, S.N.Lahiri, the Fund Manager and the Head of Equities at L&T AMC dispelled this notion that in case of sharp withdrawal by FII, the stocks could get affected; this particular fund will be minimally affected. He explained "The ownership of the Small & Mid Cap stocks is at absolute low and they are more concentrated on large caps and Large Mid caps. Small & Mid Caps names are mostly owned by Domestic players and Global liquidity should not have any impact on this Fund". The Advantage of a Close Ended fund is that the Fund Manager has sufficient time to build a stable portfolio by identifying companies which have the potential to grow faster and not worry about having to sell the same in case of a redemption. The Advantage of THIS particular NFO is that not only is the fund close ended, but investors have the option of investing through monthly SIPs. Innovative. Small Cap Space is universally acknowledged to be under valued, under researched and under owned. True, Small Caps are highly volatile but the advantage of investing through SIP in the L&T Emerging Business Fund NFO is that this volatility would be an asset as it would help in accumulating at lower NAV. And small caps are known to bounce back more strongly as compared to large caps. On an average, only seven analysts cover stocks in the bottom 300 compared to 43 covering top 100 stocks. Thus, if the Fund Manager does uncover a potential blue chip, the gains could be phenomenal. According to study done by L&T Mutual fund, a startling 41% of Small and Micro Caps are still quoting at a valuation less than 12 PE. And, in Large Cap, it is just reverse with 52% of Large Cap quoting at higher than 20. Thus huge Valuation gap exists. Small Caps are not only highly volatile, but they also suffer from low volume and less liquidity. The recent Bull run has resulted in even Small Caps gaining, thus making the task of finding Winners much more difficult. This is the FIRST fund Launch by L&T after taking over Fidelity. 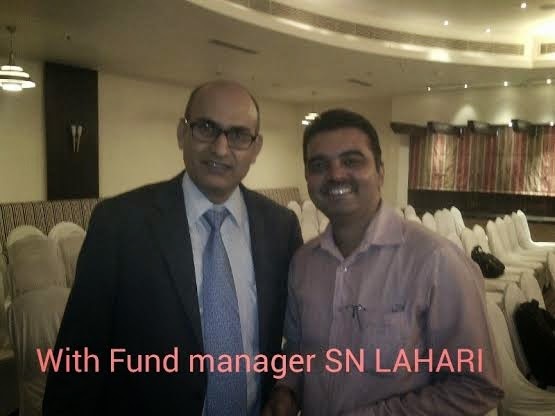 The fund Manager Mr.S.N.Lahiri had managed DSP Black Micro Cap during its NFO and in its first couple of years. The fund gave TRIPLE digit returns when he was managing the fund. Since the economy is expected to bounce back sharply in the coming 2-3 years, Small Caps, as a result, could also see good gains. The timing of this Fund is thus apt. Needless to say, Mid caps and Small Caps are highly volatile and risky but at the same time, potentially capable fo giving superior returns. Thus, with a Competent Fund Manager handling your money, with the comfort of 2 years lock-in, recommend you to go for the fund through the SIP way, especially if you have the heart to ride high volatility and have a risk tolerance. Further, please note that SIP investments will not be available through BSE STAR and NSE MFSS platforms as this is a closed ended scheme for 2 years and they do not have a system in place to report SIP transactions for closed ended schemes. So, my suggestion, take the SIP route and take the Physical Application route. For those who are averse to L&T as a Fund House, can have a look at consistent performers like Mirae Asset Emerging Bluechip Fund, Religare Mid n Small Cap Fund and DSPBR Micro Cap Fund.